Parents and caregivers, bring your energetic child to a storytime featuring hands-on, literacy-rich activities including stories, songs with fingerplays, and sign language. Develop pre-reading skills as your child makes connections between words and movement, has fun with related crafts, and socializes during playtime. Start reading to your child early and often to get them ready for school. 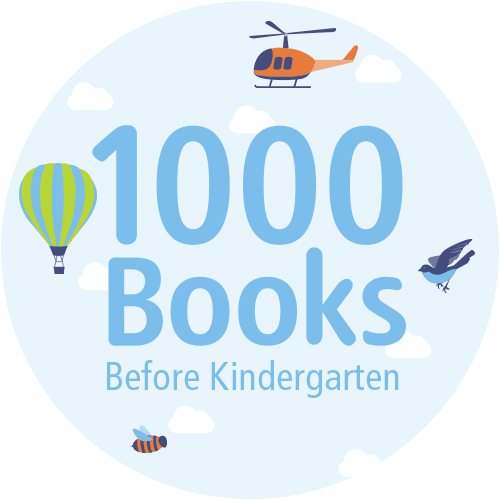 The goal is to have read 1000 books before your child starts kindergarten. Track your books with a reading log and earn small prizes along the way. Toddlers and preschoolers will explore the world through merry mess-making. Each month there will be a new set of activities to make kids squeal with glee! Let’s Play is a four-week program for children 0-5 and their parents or caregivers which focuses on child-driven play. While children explore different types of play, each week an early childhood specialist will be available to answer questions parents may have about their child’s development. Develop your child’s literacy skills with five types of activities you can integrate into your everyday life. Find out how talking, writing, reading, playing, and singing are important for kids of all ages.